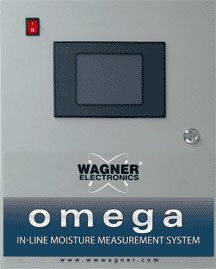 Most often installed on the outfeed side of high-speed planers or molders, an Omega system with an end-to-end sensor scans your lumber, flooring or wood components at over 300 measurements per second. End-to-end measurement is preferable when there is a need to, for example, identify wet pockets along the length of lumber that will be sold to laminated beam manufacturers. It will also allow the identification and trimming out of wet areas within strip flooring. For the secondary manufacturer, you are able to analyze your key lumber suppliers and if necessary, help them provide lumber that better meets your moisture criteria. The industrially-hardened LCD touch screen user interface is resistant to moisture, dust, and other harsh elements.